Defense Meteorological Satellite System (DMSP) spacecraft. WASHINGTON – A 20-year-old military weather satellite apparently exploded in orbit Feb. 3 following what the U.S. Air Force described as a sudden temperature spike. The "catastrophic event" produced 43 pieces of space debris, according to Air Force Space Command, which disclosed the loss of the satellite Feb. 27 in response to questions from SpaceNews. 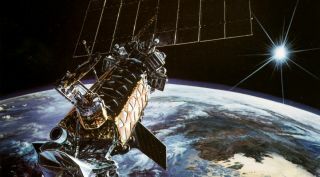 Launched in 1995, DMSP-F13 provided thousands of hours of weather imagery to Air Force and Navy forecasters before transitioning to a backup role in 2006. The Air Force said its sudden loss would have minimal impact. "Because this satellite was no longer used by the National Weather Service or the Air Force Weather Agency, the impact of the loss of this satellite is minimal," the Air Force said. "We anticipate real-time weather data for tactical users will be slightly reduced without this satellite, but its data was not being used for weather forecast modeling." The Air Force still has six DMSP satellites in service following the launch last April of DMSP-F19. A seventh satellite, DMSP-F20, was under consideration for a 2016 launch as recently as November. Air Force Space Command said DMSP-F13's power subsystem experienced "a sudden spike in temperature" followed by "an unrecoverable loss of attitude control." As DMSP operators were deciding to "render the vehicle safe" the Joint Space Operations Center at Vandenberg Air Force Base, California, identified a debris field near the satellite. The Air Force said it is continuing to track the debris and will issue conjunction warnings if necessary. "While the initial response is complete, JSpOC personnel will continue to assess this event to learn more about what happened and what it will mean for users within this orbit," said Air Force Col. John Giles, the Joint Space Operations Center’s director. DMSP-F13 flew in a 800-kilometer sun-synchronous polar orbit popular for weather and spy satellites. The first public indication of a problem with DMSP-F13 came from T.S. Kelso, a senior research astrodynamicist for Analytical Graphics' Center for Space Standards and Innovation in Colorado Springs, Colorado, who noted Feb. 25 that there had been "another debris event with 26 new pieces" in addition to five previously cataloged DMSP-F13 objects.